In a review of Vegter’s book ‘Extreme Environment’ the Mail and Guardian’s environmental writer Sipho Kings took him to task for cherry-picking facts to support his argument and world view. As pointed out in Pinnock’s criticism, Vegter relies on unscientific sources and cherry-picking to support his claims. Generalised statements and lack of proper research are the two main culprits. Yes they do Mr Vegter, and they are not the only ones. These facts are well recorded in studies. One example of many: (ALAZAWI 2011, SHAHBAZI-GAHROUEI et al. 2014). The frequency of health symptoms was compared between residents living within 300m of the cell antenna site to those living farther away than 300m. The identical results of both studies: “Most of the health complaints such as nausea, headache, dizziness, irritability, discomfort, nervousness, depression, sleep disturbance, memory loss and lowering of libido were statistically significantly more often reported by residents living near a base station (≤ 300m distance) compared to those living in a distance of more than 300m to a base station. The authors suggested that mobile phone base stations should not be sited closer than 300m to residences to minimize exposure of the residents” (EMF-Portal on the study by SHAHBAZI-GAHROUEI et al. 2014). Why do you ignore the many cell tower studies that indicate harm, Mr Vegter? Are you unaware that these studies, published in medical journals exist or do you deliberately choose to ignore it? Willful ignorance perhaps? The 2004 Naila cell tower study (EGER et al. 2004) (again, not the only one) showed an increased cancer risk. Bortkiewicz et al. have recently performed a meta-analysis and reported that their findings supported the hypothesis that long-term use of mobile phones was linked to increased risk of intracranial tumors. Another meta-analysis performed recently by Wang and Guo showed a signicant association between mobile phone use (> 5 years use) and the risk of glioma. Furthermore, Yakymenko et al. have previously reviewed the published data on the carcinogenic effects of long term exposure to low intensity microwave radiation. They stated that there were reports indicating that exposure to low intensity microwaves could lead to cancer progression in laboratory animals and humans. They also stated that the carcinogenic effect of these radiations was more prominent for long term exposures (> 10 years). So while the debate is ongoing about carcinogenity, one fact is crystal clear; We cannot state that radio waves do NOT cause cancer. Mr. Vegter, your statement “And all those people are wrong” is also wrong. Not all scientists perceive EHS to be “all in the mind” as you suggest. Study the work of Dr Belpomme, President of ARTAC, (Association of Treatment Against Cancer). A Disabled Population Deprived of Work, Home, Slideshare. See what the study below has to say about real/sham exposures. There are many scientists in the EMF field that you fail to mention: Oleg Grigoriev, Leif Salford, Mikko Ahonen, Lennart Hardell, Martin Blank, Olle Johansson, Darius Lescynski, Trevor Marshall, David Carpenter, Devra Davis, S.M.J Mortazavi , Joel Moskowitz, to name but a few. Would it not be ethical to inform your readers that there are alternative views on the topic? They disagree with you, Mr Vegter. 235 scientists from 41 nations, in fact. No words necessary. Read the above. All the evidence? In other words, Mr Vegter, you state that there is not one single study published in a medical journal that indicates harm? What a sad day for journalism in South Africa. In most studies only the impact of a single frequency is examined, but in real life all living organisms are exposed to a mixture of frequencies. Radiation from wireless communication technologies results in combination effects with other environmental exposures like amalgam, nitric oxides, fine particulate matter, lead, glyphosate, aluminum, fluorides, cadmium, plasticizers. Combination effects between ionizing and no nionizing radiation are also to be considered as a possible cause of multiple disease phenomena, which can be observed in soldiers and staff members of radar facilities. (MÄMPEL et al. 2015) We have to keep in mind therefore the role of electromagnetic radiation as an environmental pollutant. (GIBSON 2016):To psychologize persons with electromagnetic hypersensitivity is discriminatory. 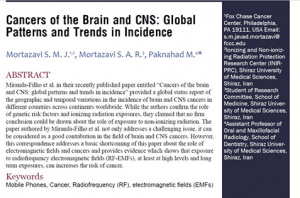 Carlberg M, Koppel T, Ahonen M, Hardell L. Case-control study on occupational exposure to extremely low-frequency electromagnetic fields and glioma risk. Am J Ind Med. 2017;60:494-503. doi.org/10.1002/ajim.22707. PubMed PMID: 28394434.
using Bayesian structural time series and synthetic controls. Environ Int. 2016;97:100-7. doi. Wang Y, Guo X. Meta-analysis of association between mobile phone use and glioma risk. J Cancer Res Ther. 2016;12:C298-C300. doi. org/10.4103/0973-1482.200759. PubMed PMID:28230042. Yakymenko I, Sidorik E, Kyrylenko S, Chekhun V. Long-term exposure to microwave radiation provokes cancer growth: evidences from radars and mobile communication systems. Exp Oncol.